The story behind the Euro-quango whose Rosetta mission finally puts Nasa in the shade. Its roots date back to the 'Sputnik shock' of the late 1950s, but the European Space Agency didn't actually come into being until 1975. Nasa had already sent 24 men to the moon and Russia's epic Salyut space station programme was in full swing, so what did ESA choose for its inaugural mission? A worthy but entirely dull unmanned orbiting probe called Cos-B. Its thunder was stolen again in the 1980s. ESA had developed the simple, cheap and effective Ariane rocket for launching satellite payloads, whereas Nasa came up with the complex, expensive, unreliable but super-glamorous Space Shuttle. They both did the same job, but only one came with astronauts, space walks and all the media-friendly jeopardy of re-entry. But – who would have guessed? – it turned out ESA was right. We all know what happened to the Shuttle, whereas Ariane 5 rockets still blast off regularly from their launchsite in French Guiana. 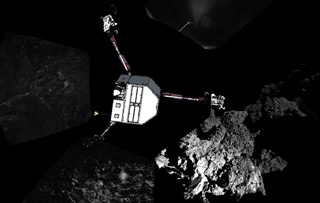 On 2 March 2004, one of them hurled the then little-known robot probe Rosetta on its way, the start of an astonishingly bold 10- year-long, four-billion-mile mission to hitch a ride on a comet, a five-kilometre-long lump of ice and rock with almost no gravity, hurtling through space at 34,000 miles an hour. Like trying to land a bullet on a howitzer shell that's still in flight. On 12 November, when Rosetta's fridge-sized offspring, the Philae lander, actually touched down on P67/Churyumov-Gerasimenko – albeit in the shade where its vital solar panels don't work – the world went comet crazy. ESA had finally done the double, achieving something of great scientific value that also captured the global imagination. Despite his avuncular looks, 68-year-old director general Jean-Jacques Dordain is a bona fide rocket scientist who narrowly missed out on making it into space as an astronaut in the 1970s. He's been in charge since 2003, and his third term is due to expire next year. Rosetta is a space saga for the robot age, proof that unmanned missions can now push the boundaries of human achievement even further than manned ones have in the past. And it's all thanks to what is essentially a species of that much-derided beast the pan-European quango. Surely there's a lesson to be learned in there somewhere? Budgets. France and Germany – ESA's two largest single contributors - are in economic trouble, Some say Rosetta was not worth its hefty €1.4bn (£1.1bn) cost, but how do you put a price on inspiration?